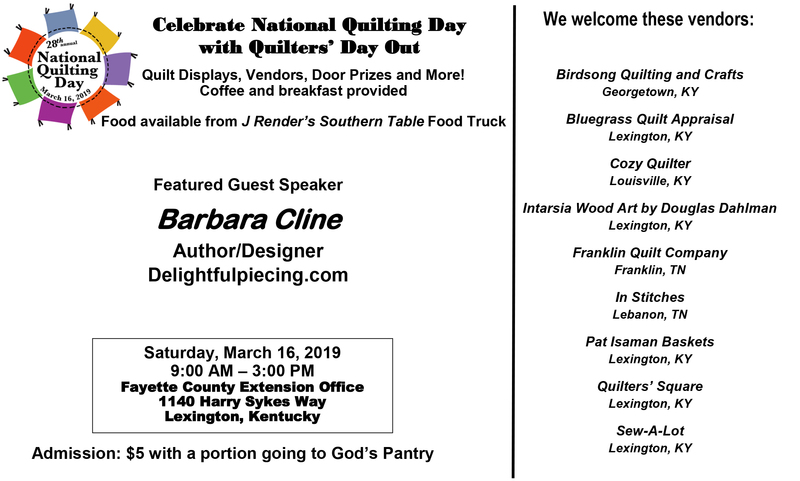 Quilters’ Day Out is Saturday March 16, 2019. Celebrate National Quilting Day with Quilters’ Day Out! There will be Quilt Displays, Vendors, Door Prizes, and More! Come join us March 16, 2019! Quilter’s Day Out is Saturday March 17. The quilts from the KHQS – President’s Challenge will be on display at QDO. The KHQS challenge was to create a St. Patrick’s or Green-themed quilt. Any of our Guild members can also bring a quilt that fits in that category. Another challenge that was presented at last years’ QDO was to make a quilt from any pattern/kit/fabric bought at the 2016 QDO and show it at the 2017 QDO. Further information about vendors etc. will be forthcoming. The 2017 QDO speaker will be guild member, Mary Beth Dunn. Come join us March 17, 2018! September 12– Special outing to Henry Clay’s Ashland Museum to view quilts not normally accessible to the general public. Note , this is not just a repeat of the quilts some saw at the slideshow last year. The meeting will start at 6:00 PM, ( not 7:00) AT ASHLAND, Henry’s Clays Home, NOT at the extension office. We will have refreshments , but NOT Show and Tell in September, and samples and details of upcoming programs will be highlighted. If you have missed summer meetings, it’s not too late to renew your membership and mail your $28 check to QGBG to Michelle Huggins at 4147 Tradition Way, Lexington, KY 40509-4486. Include any changes to your address, email or phone with your check so we may update the directory. September Sit-n-Sew will be Saturday the 16th and Sunday the 17th . (corrected dates from original post.) This is a fun opportunity to get projects finished, and see other works in progress, or get good quilty advice! If you are available to be the door volunteer for future months, please let me know. Susan and Barb will give an update at the September meeting. If anyone knows of a specific need we would appreciate hearing about it. Community quilt 9-patch blocks can be turned into Susan Lucas or Barbara McGoven at any meeting. They also have supply kits available to anyone who wants to help sew. They also have some batting available for anyone who has a quilt they would like to finish for charity. If you are a facebook user, you can join our facebook page by searching for Quilters Guild of Bluegrass and requesting to join. You can see pictures of our activities, quilts made, and works in progress. You may also upload photos of your own projects completed or in process, ask questions of members, or post sewing related items you want to give away or sell! If you are having difficulty finding it, just send a message to Cora or Elise. October – The beautiful quilts of quilter Cindy Vough will be shown. Her quilts use her ice-dyed fabric that she makes herself. She will be talking about that process with us as well. These quilts are simply stunning!! ( Note: Due to unforeseen circumstanced the Michael Young event will not happen in October as previously announced. December- Potluck , Show & Tell and a craft! Starts at 6! Thanks to everyone who made potholders for our fundraiser! Thanks especially to Rita who not only sewed a lot , but cut out mountains of square for all to use. We met our goal of 200 and will be getting a check from Kentucky Farm Bureau soon. One of our members , Mary Beth Dunn will be teaching an intermediate level Feather quilt ( seen at Show and Tell in August) at Birdsong in Georgetown Sept 8 and Sept 22 from 10:00 – 2:00pm. She will also be teaching a beginning level Baby Elephant Quilt at Quilter’s Square Sept 18 from 10:00-2:00pm. Please be kind to our wonderful membership and treasurer volunteers and turn in your renewals dues this month if you have not yet done so. You need only write one check for $28 this year (a bargain!) . If you will not be at the meeting this month, you may mail your check (contact qgbg.president@gmail.com for details). Include any changes to your address, email or phone with your check so we may update the directory. After August there will be a $5 late fee. Your dues include all the member benefits and newsletter of the Fayette Homemakers at the extension office as well as your guild membership. We hope to have the Directory ready in October. If you have not yet had your photo taken there will be another opportunity at this August meeting. In August, Sit-n-Sew space is reserved for both Saturday the 12th and Sunday the 13th if we have a volunteer to get the door at 9:00am. If you are available to volunteer for one of those days , please let me know by email as soon as possible. The quilts of valor event at the Masterston Station Fair in July was wonderful and included a display and presentation of quilts to veterans. Some pictures can be found on our facebook page. Thanks to Nancy Cann for coordinating all the guild members who volunteered and helped out! If you have been making extra B.O.M. red, white and blue blocks, you may give them to Rhonda Tiefert. Sue and Barb met with Sherry Jackson, community relations director of Chrysalis House, to evaluate the supply of quilts they have on hand. Over this past year we have brought them approximately 30 quilts of various sizes for which they are very grateful. At the moment they have an ample supply for their present live-in situation. She did say she would like to call us as needs arise. But this month Chrysalis House is collaborating with the Community Action Center to open a new drop in day care center within their present facility. Extra baby/children quilts would be much used for this new addition. Though for now , Chrysalis House will remain our primary goal, we would like to consider adding an additional organization that would benefit from the generosity of our guild. If anyone knows of a specific need we would appreciate hearing about it. Community quilt 9-patch blocks can be turned into Susan Lucas or Barbara McGoven at any meeting. They also have supply kits available to anyone who wants to help sew. They also have some batting available for anyone who has a quilt they would like to finish for charity. The board voted yes in July to a great fundraising opportunity thru the extension office to make 200 potholders as favors for a Farm Bureau event. So far we have turned in 100 farm, food and kitchen themed potholders, and only need 100 more by August 12th. ( Thanks to everyone who has helped so far.) If you want to help, contact Elise at elisekalika56@gmail.com if you need insulbrite batting or have questions; or come to the open sew days every Tuesday at the extension office. We are making them to finish at about 6” with a hanging loop. We heard a truly enjoyable lecture at the recent Dr. Linda Pryzbysewski event in July that was also co-sponsored with the extension office and the Master Clothing Volunteers group. Over 100 people attended, about half from the sponsoring groups and the other half from all across the state- a great PR event for both groups. Thanks to all the volunteers who helped make it such a fun morning! If you are a facebook user, you can join our facebook page by searching facebook for Quilters Guild of Bluegrass and requesting to join. (Or click here). You can see pictures of our activities, quilts made, and works in progress. You may also upload photos of your own projects completed or in process, ask questions of members, or post sewing related items you want to give away or sell! Thanks to Beth Tibbitts, one of our new members, we also have a website page which can be found out https://quiltguildbg.org This is a work in progress, and will be a great way for newcomers to the Bluegrass to find us! September- Special outing to Henry Clay’s Ashland Museum to view quilts not normally accessible to the general public. We will meet at the museum beginning at 6pm- NOT the extension office. More specific information will be sent in next months mailer. Minutes of our regular July meeting will be sent out separately. MORE JULY QUILTERS GUILD OF THE BLUEGRASS NEWS! JULY IS DUES MONTH! In an effort to “keep it simple”, (and thanks to our extension agent Liz Kingland), we no longer have to write 2 checks for our dues. So this coming Tuesday, July 11th, just bring one (1) check made out to QGBG for $28 to renew your membership. Change is good! YOU DON’T WANT TO MISS THIS GREAT SPEAKER! BONUS!! Saturday July 15 will be a lecture with Linda Przybyszewski, New York Times Bestselling Author of “The Lost Art of the Dress.” Doors open at 9 am. This event isFREE to guild members in good standing , $10 to the general public , and includes a continental breakfast. Bring a friend! A few more volunteers are needed for helping with the registration desk and clean up for the July 15th event. Reply to this email or send and email to elisekalika56@gmail.com if you can help. Liz Kingland will be providing the insul-brite for the potholder batting. There are several ways you can participate. 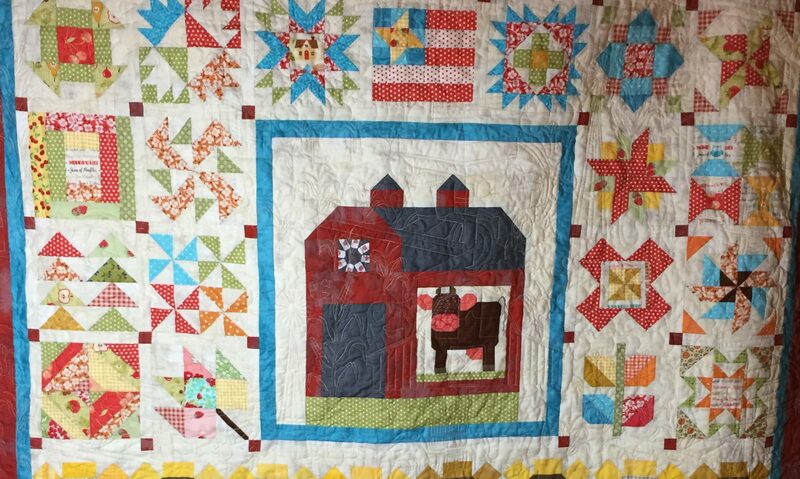 If you have any kitchen, food, denim, or farm themed fabric you would like to donate , please bring it to Elise at the July meeting (or let me know how I can get it from you.) We will also be having some group sewing days to make them at the extension office on Tuesdays in July and early August, as there is open sewing from 9am-5pm on Tuesdays this summer. You can also make some potholders at home , simple – turned with a hanging loop, or fancy ones with a binding & hanging loop — either is fine. Rita cut her squares 6″ to finish at 5 1/2″ , but you can cut them a little bigger, 6 1/2″ cut finishes to a nice 6″ size. More info to follow! Our regular meeting will be Tuesday July 11th. Meet and greet starts at 6:30 pm, and our program starts at 7:00 pm, at the Extension Office in room B. Our program will be by Mary Beth Dunn teaching us some fabric origami skills. This meeting has an opportunity for some hands-on fun : Please bring a needle, thread, glue stick& pencil or pen. BONUS!! Saturday July 15 will be a lecture with Linda Przybyszewski, New York Times Bestselling Author of “The Lost Art of the Dress.” You won’t want to miss this! Doors open at 9 am. This event is free to guild members in good standing , $10 to the general public , and includes a continental breakfast. And speaking of members in good standing, July is the month to renew your membership. You will be able to do so at the Tuesday meeting or the Saturday event. Please remember to bring 2 checks. One for $8 to the Fayette County Homemakers, and one for $20 to QGBG. Because of the Saturday event , we will not have a Sit-n- Sew in July at this time. If two people volunteer to coordinate one for Sunday the16th, and contacts us, we can schedule one and send an announcement. A few more volunteers are needed for helping with the registration desk and clean up for the July 15th event. Contact Elise if you can help. Also, the Lions Club Fair schedule for sitting with the Quilts of Valor display has been changed to Thursday and Friday , July 20-21. If you can help sit with the quilts for a few hours on either of these days , please contact Nancy Cann at nancy.cann@qovf.org. 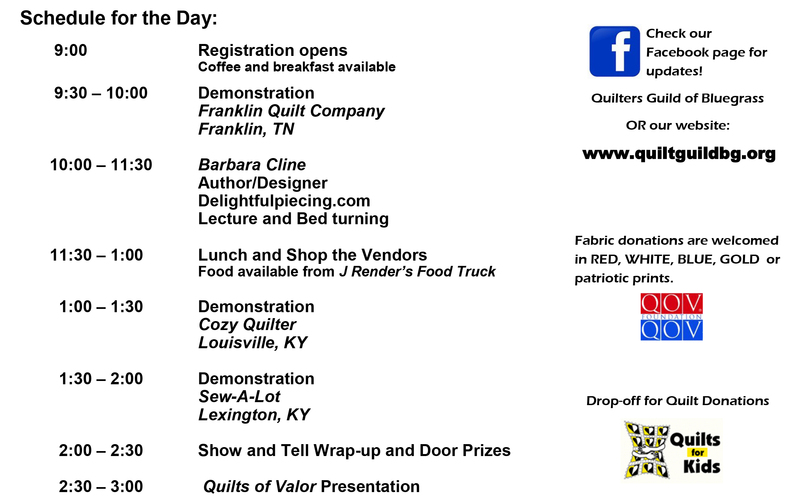 This is a great event for quilters to support! If you have been making extra B.O.M. red, white and blue blocks, you may give them to Rhonda Tiefert. Community quilt 9-patch blocks can be turned into Susan Lucas or Barbara McGoven at any meeting. They also have supply kits available to anyone who wants to help make some! There will be a joint Board Meeting Friday, July 7th at 2pm at the Extension office in Room A. Minutes of our regular June meeting are attached to the email sent out to all members.